Dublin City MayorSouth Dublin County CouncilSouth Dublin County Council launches six new GoCar car sharing bases. 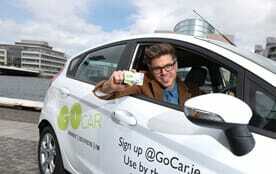 South Dublin County Council launches six new GoCar car sharing bases. South Dublin County Council and car sharing firm GoCar are jointly launching six new on-street bases for a car sharing rental service which allows users to hire a car for as little as one hour for an all in cost that includes fuel, tax, insurance and maintenance. Car Sharing is aimed at everyone from the urban dweller, to the one car family, the SME start up to the large corporations! Car sharing is the perfect addition for the modern on-the-go lifestyle. Car sharing works effectively when combined with other public transport options such as buses, trains and trams along with taxis or for that once off necessary journey. The implementation of this scheme is in response to the success of the car – sharing initiative with Dublin City Council, which has seen increased demand from residents and businesses since GoCar was launched in 2008.